On May 13th, 2003 the Hellas-Sat 2 satellite, aboard an ATLAS V rocket was launched successfully into orbit, signalling the beginning of a new era in the telecommunications domain for the countries of Greece and Cyprus. An endeavor dated almost ten years ago since the administration of Greece first filed its Ku-band national satellite system at 39 degrees East with ITU. A few years later, the administration of Cyprus filed complimentary frequencies for the same orbital slot and the HELLAS SAT system was born. 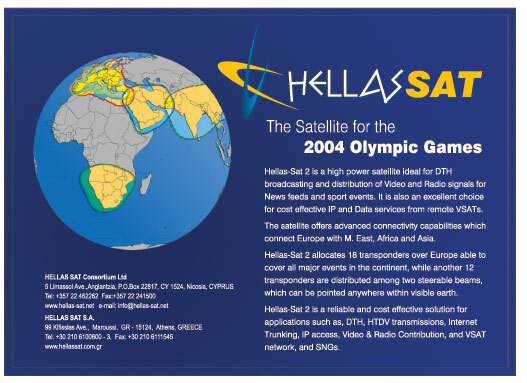 Financially backed by the Hellenic Telecommunications Organization (OTE) and receiving strong support by all political parties in both countries, the launched satellite is perceived as part of the national telecommunications infrastructure servicing the Olympic Games of 2004 in Greece. The Hellas-Sat 2 satellite is considered as one of the most powerful Ku-band satellites in Europe today. It is built by EADS ASTRIUM based on a EuroStar 2000 + platform, which is known for its reliability and its proven in-orbit performance. The Hellas-Sat 2 is a multi-region geostationary satellite system offering total space capacity of 30 active high power Ku-band transponders with a nominal bandwidth of 36 MHz each. The satellite carries four antennas, which produce two steerable and two fixed beams. 18 out of 30 transponders are distributed among the two fixed beams, F1 and F2, placed over Europe and M.East. The remaining 12 transponders are distributed among the two steerable beams S1 and S2 which can be pointed anywhere within the visible earth. There are 38 available TWT Amplifiers on board, each with a nominal power of 105 W, offering a 38:30 redundancy. The advanced switching capabilities of the satellite allow interconnectivity between the fixed and steerable beams as well as between the steerable beams. Due to the precise positioning into orbit, the satellite life span exceeds 15 years. Besides its heavy duty during the Olympic Games, the satellite is expected to generate momentum to the development of satellite applications and services for the private and public sector. It will also provide alternative routes and backup solutions to the traditional telecommunications infrastructure within both countries and moreover the whole region. The satellite is going to strengthen the strategic role of Greece in the Balkan Peninsula and S.E Europe, offering cost effective and reliable infrastructure to the developing countries of the Region. The satellite is ideal for quick deployment of telecom and broadcasting services where land infrastructure is not only poor but also obsolete. Hellas-Sat 2 aims to become the primary TV neighborhood for the Balkan countries not only for the local inhabitants but also for the multiethnic Diaspora living in Europe. Cultural exchange, educational cooperation and financial transactions shall take place on Hellas-Sat 2 satellite. HELLAS SAT Consortium Ltd a joint Greece-Cyprus venture registered in Cyprus with the Hellenic Telecommunications Organization (OTE) as the majority shareholder, partnered with other strategic investors from Greece and Cyprus. HELLAS SAT S.A is registered in Greece being subsidiary of the Cyprus Company. The Greek company manages and operates the uplink infrastructure of the Hellenic Telecommunications Organization (OTE) which is able to access 5 transponders providing multiplexing facilities for Video and Radio services, Conditional access for pay TV services and IP/data handling. The satellite is controlled via two 24X7 TT&C stations located in Greece and Cyprus while uplink transmission quality is ensured through our Carrier Monitoring Station network. The booking office operates 24X7 offering Occasional Use capacity for ad-hoc services and special events. During the Olympic games the personnel is expected to double. A great variety of applications is possible from Hellas-Sat 2. Most of these fall into two main categories: broadcasting or one-way applications and interactive or two-way applications. Users are equipped with Very Small Aperture Terminal (VSAT), which provide affordable access to communications services either being DVB–S type or legacy VSAT systems. The distance learning, for instance, enables an instructor to have on-line interaction with students located hundreds of kilometers away. The instructor’s voice and image is transmitted from the studio to all remote classrooms. Students watch the lecture on a TV or PC screen and actively participate in the lessons using a standard telephone set to ask or reply to questions. Internet applications via satellite benefit the ISP by avoiding the need for dedicated terrestrial high-speed lines. Moreover, they provide a fast and cost effective solution to reach population groups, which are hard to reach otherwise. Furthermore, service providers can piggy-back Internet traffic on top of existing digital TV carriers, thereby utilizing existing infrastructure cost-effectively. Data request retrieval from remote sensing on oil drilling, pipe lines, gas and electric industries. The gas station application, for instance, provides an ideal match for VSAT networking. Indeed, due to its nature as a one-stop-shop center (pump/store/restaurant) highly visited by a large number of people from early morning till late night, there is a great demand for credit cards authorization on an international level. The combination of VSAT and a Wireless Local Loop (WLL) can extend the basic phone service to places where other technologies are not cost effective. For example, a VSAT equipped with a small number of satellite channels and a WLL base station can serve a population of some hundreds telephones. The telephones can be wireless pay phones powered by solar cells or fixed wireless phones for domestic or business users. Interactive video compression techniques enable video conferencing at data rates as low as 64kbit/s. However, a 384kbit/s rate is the best trade off between quality and cost. VSAT users generally implement outbound video at 384 kbit/s and inbound video at 64kbit/s, which ensures good quality in the outbound and cost savings in the inbound. Telemedicine is a suitable application for remote areas where, in case of medical emergency, the local doctor requires help from a central hospital. All data concerning the situation of the patient may be sent immediately to the hospital in order to receive guidelines. A surgery is also possible to be materialized in real time by using the experience of specialized doctors located very far away from a hospital. The required bit rate for such an application might range from 384 Kbit/s up to 3 Mbit/s. These networks typically have a small number of VSATs and can handle up to 2 Mbit/s. They are mainly used for reasons of availability, security and/or economies when compared to terrestrial networks. The recently developed system, which is based on the DVB-RCS standard (Digital Video Broadcasting-Return Channel System) provides interconnection between users who are exchanging data on real time. The forward link (from the Hub to the satellite) is based on a DVB/MPEG-2 format and the return link (from the user terminal to the Hub) is using a Multi- Frequency TDMA scheme allowing a two-way exchange of large amount of data (up to 2Mbps or more per carrier) between users. The return link may consist of the multiplexing of several components (eg. video, data, audio) that originate from the particular home or office. The Hellas Sat system is looking ahead to the future – planning the 2nd satellite in orbit, which shall be co-located at 39 degrees East, adding new transponders to the existing ones and expanding into new frequency bands.